This multi-view pant-tilt-zoom-camera (PTZ) dataset features competitive alpine skiers performing giant slalom runs. 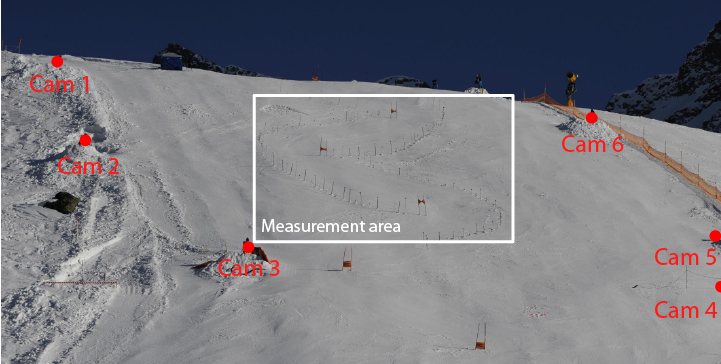 It provides labels for the skiers’ 3D poses in each frame, their projected 2D pose in all 20k images, and accurate per-frame calibration of the PTZ cameras. The dataset was collected by Spörri and Colleagues within his Habilitation at the Department of Sport Science and Kinesiology of the University of Salzburg [Spörri16], and was previously used as a reference in different methodological studies [Gilgien13, Gilgien14, Gilgien 15, Fasel16, Fasel18, Rhodin18]. Moreover, upon request the dataset would be available to interested researchers for further methodological-orientated research purposes. The underlying data collection methods are described in detail elsewhere [Spörri16, Gilgien13, Gilgien14, Gilgien 15, Fasel16, Fasel18, Rhodin18]. The global locations of the cameras and of static reference markers (black spheres) were geodetically measured by a tachymeter theodolite (Leica Total station 1200). A trained annotator clicked on the visible reference markers in each view and frame to determine the camera pan, tilt and zoom. In the same way, 22 human joints were marked at their visual center and triangulated. The average Euclidean error of such a procedure is 23 +- 10 mm, determined by comparing the photogrammetric marker estimates with the theodolite ones [Klous10]. Possible click-inaccuracies were mitigated by normalizing bone length to be constant at their anthropometrically measured values [Smith94]. Re-projection of the 3D annotation shows a very accurate overlap with the images. Your full name, affiliation (send the email from your institutional mail address), your supervisor (professor), and your intended use case. [Spörri16] Spörri, J. (2016). Research Dedicated to Sports Injury Prevention – the ‘Sequence of Prevention’ on the example of Alpine Ski Racing. Habilitation with Venia Docendi in “Biomechanics”. Department of Sport Science and Kinesiology, University of Salzburg. [Fasel18] Fasel, B., et al. (2018). “Joint Inertial Sensor Orientation Drift Reduction for Highly Dynamic Movements.” IEEE J Biomed Health Inform 22(1): 77-86. [Fasel16] Fasel, B., et al. (2016). Three-dimensional body and centre of mass kinematics in alpine ski racing using differential GNSS and inertial sensors. Remote Sensing, 8(8), 671. [Gilgien15] Gilgien, M., et al. (2015). “Determination of the centre of mass kinematics in alpine skiing using differential global navigation satellite systems.” J Sports Sci 33(9): 960-969. [Gilgien14] Gilgien, M., et al. (2014). “The effect of different global navigation satellite system methods on positioning accuracy in elite alpine skiing.” Sensors (Basel) 14(10): 18433-18453. [Gilgien13] Gilgien, M., et al. (2013). “Determination of external forces in alpine skiing using a differential global navigation satellite system.” Sensors (Basel) 13(8): 9821-9835. [Klous10] Klous, M., et al. (2010). Collecting Kinematic Data on a Ski/snowboard Track with Panning, Tilting, and Zooming Cameras: Is There Sufficient Accuracy for a Biomechanical Analysis? Journal of Sports Sciences , 28(12):1345–1353. [Smith94] Smith, G. (1994) An iterative segment length normalization routine for use with linked segment models. In 18th annual meeting of the American society of biomechanics (pp. 35–36). Columbus, OH.